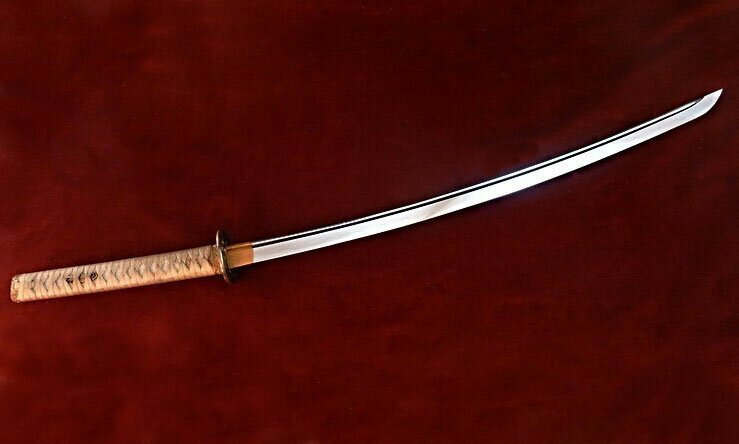 Citadel Katana Special Waves(CDK6) Katanas for tameshigiri, forged, sharpened and polished in traditional way. Differentially hardened with authentic hamon. Beautiful replica of a Shinto Katana. The decoration work is on the theme of waves and goes along with a strong, grooved blade. Beautiful, well balanced, DNH7 steel Yamato blade forged with 3 hammers on a charcoal bed. True clay selective temper, as usual. Hand sharpened, hand polished DNH7 high carbon steel blade with true differential quenching. Genuine white rayskin handle with silk cord wrap. Black finish handmade iron tsuba. Black lacquer finish wood scabbard. Delivered with its high grade Japanese silk Sageo, in its silk sleeve and its cordura carrying case with pocket for cleaning kit (not provided) and adjustable strap. Habaki : reinforced, tempered copper forged on its blade, grooved and finely engraved of parallele lines. Tsuba : Nagamaru gata with Mimi, lost wax cast brass. Omote side represents 2 boats in a tempest with Fuji Yama in back ground, Ura side opposes the waves and the clouds . Two Itsu Ana. Tsuka : 11.22", top quality white Same, lost wax cast brass "waves" Menukis, bamboo conical Mekugi, Japanese high grade silk Ineri Makibraid, filed brass two foils Ito Domes. Saya : Jackwood, glossy black smooth lacquer. Kurigata, Kojiri and koigushi are made of water buffalo horn. Filed brass two foils Shito Domes. Fushi-Kashira : Lost wax cast bronze sculpted on a theme of waves. Can be fully disassembled. Blade carries lifetime guarantee subjected to normel use in a Dojo.